On December 12, Deadpool 2 is back in theaters with zero Fs given. 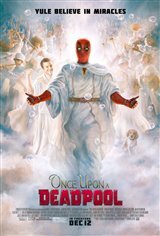 To kick off the holiday season, audiences of almost all ages will soon be able to enjoy the Merc with the Mouth’s reimagining of Deadpool 2 filtered through the prism of childlike innocence. Fred Savage will join Ryan Reynolds in new scenes filmed especially for ONCE UPON A DEADPOOL in an homage to Savage's starring role in the 1987 bedtime-story classic THE PRINCESS BRIDE.